General Motors enthusiast communities are abuzz after discovering that the automaker has applied for a handful of old school high performance engine monikers including LT4, LT5, L88 and LTX – leading to much speculation as to what might be coming for the new Corvette, the next generation Camaro and the new Chevy SS performance sedan over the next few years. I should start by pointing out that it is not uncommon for an automaker to apply for certain trademark names simply to protect other automakers from using them so the General Motors’ attempt to secure the rights to names like LT4, LT5, L88 and LTX could have nothing to do with the future of the Corvette or Camaro. However, when we look at the fact that all of the American automakers (and many loyal enthusiasts) enjoy seeing old school naming cues on modern vehicles – these reincarnated engine names could offer a hint of what is coming in terms of GM high performance V8 engines. The odds are good that if you are reading this, you know that the new LT1 engine found under the hood of the 2014 Chevrolet Corvette Stingray derives its name from a series of high performance engines first introduced in 1970. From 1970-1072, the LT1 was a high performance engine option for the Corvette and the Camaro Z/28 in a time where rising fuel costs and growing concerns about engine efficiency were leading automakers and buyers away from the monster big blocks. After a short stint under the hood of the Corvette and the Camaro in the golden era of the American muscle car, the LT1 name popped back into the limelight in the early 90s when it was applied to the comparatively low performance V8 that was standard in the Corvette and select versions of the Camaro and the Pontiac Firebird. It was during that second appearance of the LT1 name where higher performance variants based on the 1990s LT engine construction were introduced, including the LT4 and the LT5. The LT4 was a tweaked version of the LT1 that would power a limited number of Camaro and Firebird models while also serving as the keystone of the C4 Corvette Grand Sport. The LT5 was engineered with the help of Lotus for use in the 1990-1995 Corvette ZR1 and for its time – it was one of the most powerful American engines available. 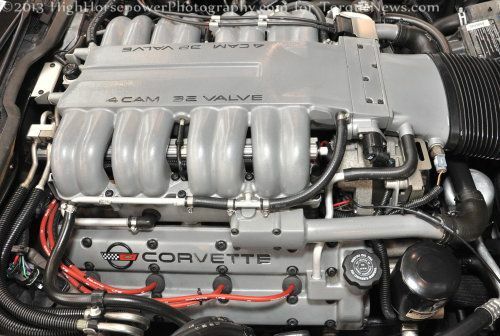 The image above shows the LT5 in the engine bay of the C4 ZR1. That very brief automotive history lesson offers many enthusiasts a clear explanation as to why General Motors has applied for new trademarks of the LT4 and LT5 engine names. Based on the history of the LT4 name, it is rumored that GM will introduce a slightly more powerful version of the LT1 engine found in the 2014 Corvette Stingray that could serve as an evolutionary replacement to the LT1 in the next few years. In the past, GM has made moves to keep the Corvette one step ahead of the Camaro in terms of performance and with the next generation Camaro due out in the next couple of years, GM might up the ante with the standard Corvette with a new, more powerful LT4 when the 6th generation Camaro receives the current Corvette’s LT1. The LT4 could also be used as a sort of “medium performance” engine, placing itself between the base Corvette engine and whatever high performance mill is chosen for the next generation Corvette ZR1 (possibly the C7 Corvette Grand Sport). As for the new LT5, with the original LT5 being used only in the C4 Corvette ZR1 – we have no reason to think that the new LT5 will be anything other than the heart of the upcoming C7 ZR1. Unlike the original LT5 that relied on a then-unique overhead camshaft setup, we would expect that the new LT5 would follow the supercharged design cues of the high performance LS9 currently powering the C6 Corvette ZR1. Now, what about the L88 and LTX? The L88 name first appeared back in the 1960s as a rare, ultra high performance engine package for the Chevrolet Corvette. The original L88 was essentially a racing setup that relied on a collection of lightweight features that made it ideal for racing use both in terms of power and durability. The L88 package back then was applied to the 427 cubic inch big block – which just happens to be the same engine size as the mill currently at work in the C6 Corvette Z06. The Corvette Z06 is frequently recognized for its street legal-yet-race ready construction that focuses around the high performance 7.0L engine. There has been quite a bit of speculation as to what engine the C7 Corvette Z06 would use with the base Vette moving to the LT1 engine platform and the L88 could be the Z06 version of the base C7 Stingray’s LT1. Like the original L88, the new L88 for the C7 Corvette Z06 would feature a handful of features that make it lighter, more powerful and more durable than the LT1 – all of which are features of the 7.0L LS7 found in the current Corvette Z06 and the new Camaro Z/28. As for the LTX, this could either be a general term used to describe the entire current LT-based engine family or it could apply to a new GM Performance Parts crate motor. GMPP has offered a high performance, non-production V8 based on the LS engine series for some time named the LSX and the LTX could be the evolutionary replacement for GM’s popular crate engine. Of course, all of this speculation could be nothing but hopeful dreaming but with so many rumors about higher performance variants of the Corvette and Camaro leaving so many question as to what engine might power said new packages – the LT4, LT5 and L88 could very well serve as new engine options for the C7 Corvette and the 6th generation Camaro over the next few years. Need front view of ZR1 LT5 engine to see what I need to complete mine as I am missing some parts.